A320 Airbus is a flight simulator personal computer game released in 1991 in which the player pilots an Airbus A320. The game was developed over three years, with cooperation from Lufthansa, Deutsche Airbus and Jeppesen. Originally the game was written by Rainer Bopf on Amiga and converted to the Atari ST by Christian Jungen. Last known version of the game is 1.44. In 1993 Thalion published two data disks which could be played as a separate game. They were based on the latest version of the game engine. They focused on different flying areas. Europe Edition covered the area of Europe and USA Edition covered the area of USA. In the latter player was able to choose the region of West Coast USA or North East USA. 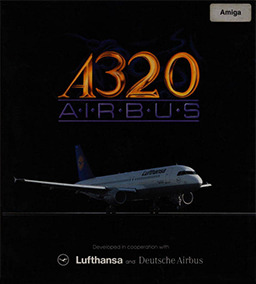 In 1995 Games 4 Europe software house published an official sequel called A320 Airbus Vol. 2. It was entirely written by Rainer Bopf with no additional help from third parties.